It was sadly only a flying visit for a few hours, as I didn’t have the holiday left to take the time off work and head down properly. Crimefest this year though had an awesome list of guests, and whilst I didn’t head into any of the panals I did have an absolutely fabulous time catching up with a lot of friends. Unless there is a chance of someone being on a booktour nearby, this being the fiirst festival of the year, is always the first excuse for a jolly and a catch up. It’s also a good precurser to Harrogate Crime Festival. The first year I met Boo I took him here first, as it’s a great way to get ‘into’ what festivals are like. Harrogate is big and loud and great fun, Bristol gives you the chance to get an idea without the in your face, OMG, there are ‘real authors’ here type of fan boy thinking. 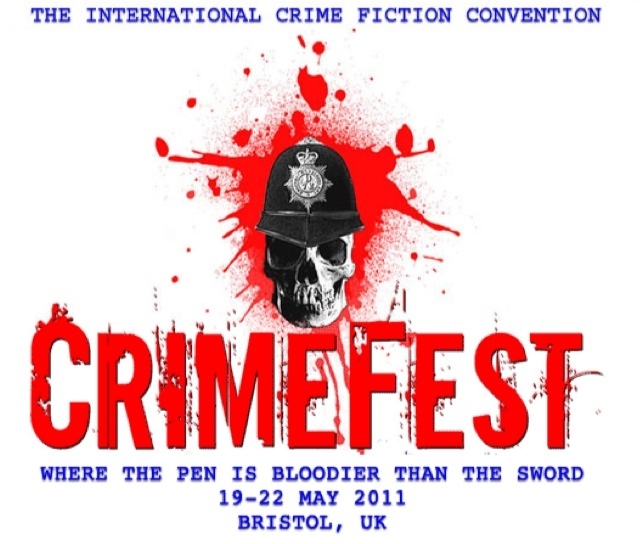 If you love anything to do with crime fiction, then this really is the one of the top places you should be. Next years festival runs from the 24th – 27th May 2012. Keep an eye on their website for details.